Darwin's Disciple is a careful biographical study of the life and letters of George John Romanes (1848-1894), who was a strong advocate for Darwinian evolution. 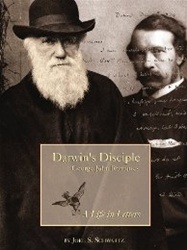 "Because of his cental role in definding evolution and his close relationship with Darwin during the last decade of Darwin's life, Romanes's life and career deserve a fresh look." This publication by Joel Schwartz is the culmination of more than thirty-five years of work in this history of biology, particularly nineteenth-century natural history and the role played by prominent early evolutionists in shaping the debates in evolutionary biology.